Utility blades never seem to last long enough, and now finally somebody is doing something about it. Stanley has launched a new utility blade that uses carbide to help strengthen the edge of the blade. They use some cool new laser technology that deposits tungsten carbide powder onto the edge of every blade, then use diamond wheels to grind on a razor sharp finished angle. This new procedure is said provide the blades with an edge that outlasts the competition by more the five times, but still remains flexible. "The introduction of the new Stanley CARBIDE blades represents a strong commitment to innovation that began with extensive field research with professional contractors who rely on our products every day," said Sara Godding, global product manager for knives and blades. "By lasting significantly longer than other blades on the market, we're confident our new utility blades will meet contractors' needs and lead to greater productivity on the jobsite." 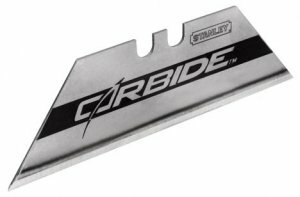 The new CARBIDE Utility Blades are available now. The blades are expected to retail in packs of five (11-800) for approximately $4.99, packs of 10 (11-800T) for $7.99 and packs of 50 (11-800L) for $24.99. Want to test the new blade out first? Stanley is giving away free samples at stanleytools.com/carbide.